Senator Ed Markey visited Pittsfield earlier this month. WASHINGTON — Senator Edward J. Markey on Wednesday said he would support the Iran nuclear agreement, offering his endorsement on a highly charged issue that has been dividing some Democrats. Markey — a Massachusetts Democrat who took the seat long held by Secretary of State John Kerry, who negotiated the deal — said in a statement provided to the Globe that he believes that the negotiated deal is the best way to ensure Iran doesn’t build a nuclear weapon. Markey is the latest member of the Massachusetts delegation to announce support for the deal. Earlier this month, Senator Elizabeth Warren, as well as Representatives Seth Moulton, Stephen Lynch, and Jim McGovern, also announced their support. Representative Michael Capuano has said he is “leaning strongly in favor,” and no member of the all-Democratic delegation has come out against the deal. 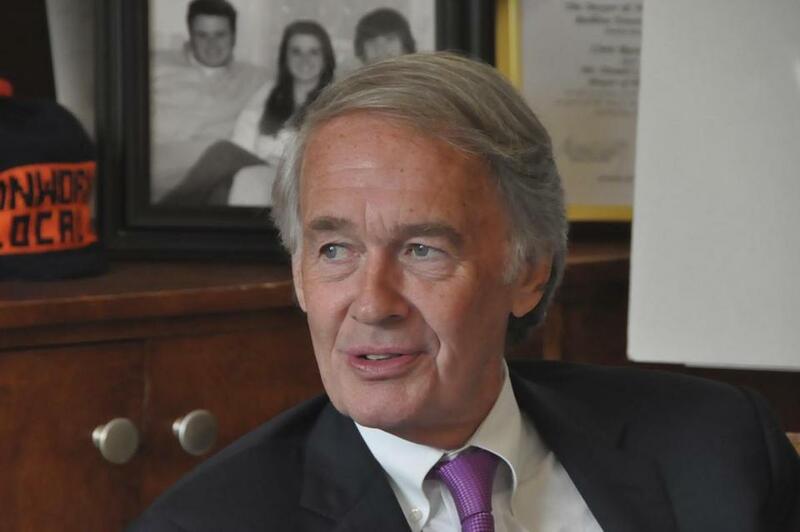 Senator Edward Markey said Wednesday that he would support the agreement on Iran nuclear arms. But the accord, negotiated in Vienna, has sparked bipartisan opposition. Several prominent Democrats, including Senators Charles E. Schumer of New York and Bob Menendez of New Jersey have come out against it. Congress has until mid-September to review the deal and pass a resolution of disapproval before it begins to take effect. It appears likely that such a resolution would have enough votes to pass, but given a veto threat from Obama, opponents will need to amass at least a two-thirds majority for an override. Obama would need 34 members of the Senate or 146 members of the House in order to preserve the deal. If Republicans all band together in opposition, he could only afford a small number of Democratic defections. Opponents of the deal say it contains a weak inspections process that could allow Iran to cheat and hide nuclear material to build a bomb. They also say that the lifting of arms embargoes, which could start occurring within five years, would allow Iran to build and ship larger conventional weapons using a new influx of cash. In the end, after briefings from Kerry as well as Energy Secretary Ernest Moniz, Markey said that he believes that the inspection regime will help alert the international community if Iran doesn’t live up to the terms of the deal.